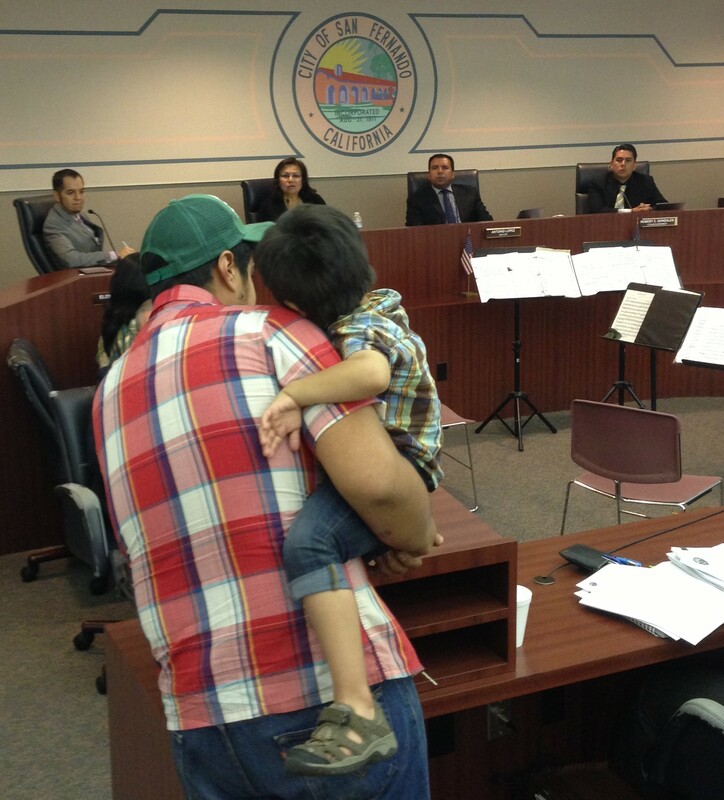 Salvador Valentin, of Bikesan@s del Valle collective, and his son Isaac testify in support of the Pacoima Wash Bikeway. The San Fernando City Council approved moving forward with pursuing state funding for the project. Last night, the city of San Fernando moved a step closer to constructing a new bike path along the Pacoima Wash. The city council voted unanimously, 5-0, in favor of seeking California state Active Transportation Program (ATP) funding. If everything goes smoothly, the Pacoima Wash Bikeway would open to the public in early 2017. The bike path will extend the full 1.6-mile length of the Pacoima Wash within the City of San Fernando, from roughly San Fernando Road to Foothill Boulevard. It will also connect with the city’s existing rail-with-trail bike path that runs between San Fernando Road and the Metrolink railroad tracks. That bike path is currently being extended eastward, with construction underway within the city of Los Angeles. The Pacoima Wash is a tributary of the Los Angeles River. It runs more-or-less north-south through the San Fernando Valley, through the city of San Fernando and neighborhoods within the city of Los Angeles including Sylmar, Pacoima, and Arleta, where it joins the Tujunga Wash. Like many southland creeks, the Pacoima Wash is encased in concrete and fenced off. In 2000, the city of San Fernando adopted a plan for parks and bicycle and pedestrian paths along the Pacoima Wash. The city sought and obtained project funding from Metro’s 2007 Call for Projects. In 2008, the nonprofit Pacoima Beautiful obtained County Public Health PLACE grant funding to extend Pacoima greenway planning to San Fernando’s adjacent city of L.A. neighborhoods. Pacoima Beautiful spearheaded the planning process for the Pacoima Wash Vision Plan, which calls for a 2.6-mile bikeway connecting with the Angeles National Forest. There are two new small Pacoima Wash parks already underway, both collaborations between cities and the Mountains Recreation and Conservation Authority (MRCA.) The city of San Fernando’s 8th Street Park is complete and ready for its grand opening, anticipated very soon. Nearby downstream, in the city of L.A.’s Pacoima neighborhood, El Dorado Park is funded and currently being designed. Things appeared to be moving along well, albeit slowly, for Pacoima Wash revitalization. Then Metro pulled back its funding, requiring that San Fernando instead apply for state ATP funding. This triggered the need for a new vote at the San Fernando City Council, where elected officials and staff are almost all new since the 2007 Metro funding was obtained. Ultimately, when it became clear that Mayor Pro Tem Sylvia Ballin and Mayor Antonio Lopez were joining longtime Wash-proponent Councilmember Jesse Avila, a majority of the 5-member council was clearly going to carry support for the project. When the vote was taken, it was unanimous in favor of the Pacoima Wash. 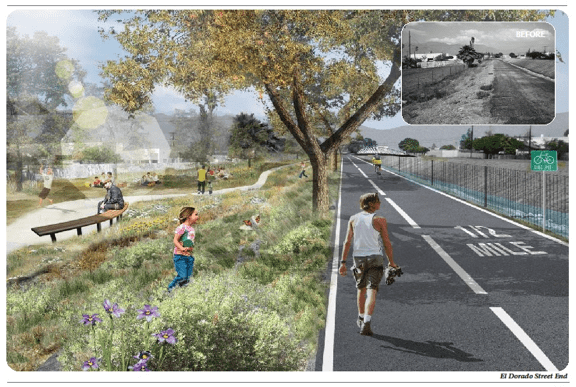 Planned Pacoima Wash walk and bike paths, rendering from the Pacoima Wash Vision Plan. The city of San Fernando will now receive Metro assistance in preparing an application for state ATP funding. Funding is expected to be awarded in late 2014. Construction should begin in 2015 and be completed early 2017.